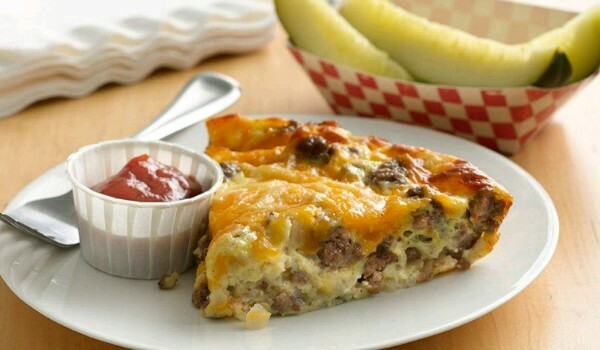 Cheeseburger Pie is a very popular recipe. Learn how to make/prepare Cheeseburger Pie by following this easy recipe. Knead soft and smooth dough by combining biscuit baking mix and milk. Roll out into a pie crust about 2 inches larger than an inverted 9-inch pie pan. Place into the pan and flute the edges. Keep aside. Fry beef, along with onion, until brown in the rendered fat. Remove the extra fat. Stir in salt, black pepper, biscuit baking mix, and Worcestershire sauce. Remove from heat and leave aside for a while. Spread the meat over the rolled-out dough. Arrange tomato slices on the meat mixture. Beat eggs slightly and pour all over the tomatoes. Sprinkle cheese and bake for 30 minutes.